The Melodia writing desk is completely new to the Arredoclassic range. This simple element with its sober forms which calibrate smooth surfaces and decorative taste well, decorate your work area with an Italian refinement which stands out in any situation. The large work surface is embellished with delicate screen printing which, in a subtle play of equilibrium, becomes the perfect foil for the rich frieze at the base of the front. This feature perfectly expounds attention to functional research and the side drawers – thanks to their small support wheels – can be moved in line with your needs. 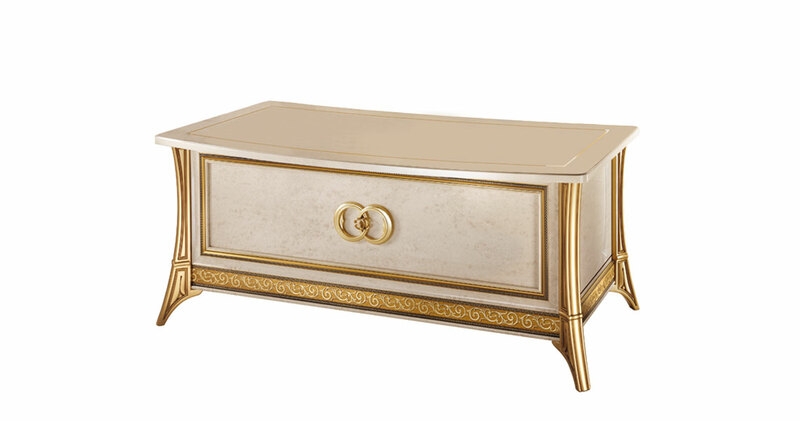 All these features are enriched with a delightful gilt bordering work which embellishes the front of the four storage drawers. There is no need to ever forgo the pleasure of quality detailing.